"I'm just trying to communicate what I've learned, like the truth is undisputed, the truth ain't gonna change." In August of 1998, I was lucky enough to attend one of the most anticipated music festivals of the summer�the Smokin' Grooves Tour. Among the powerhouse lineup of hip-hop stars were Public Enemy, Wyclef Jean, and Cypress Hill. All of these acts performed well and generated tremendous reactions from the audience, but the most entertaining set of the day belonged to the raucous Busta Rhymes. With his lengthy dreads springing in all directions from a massive frame, his energetic presence lifted the crowd to its feet long before the featured acts. Supported by the Flip Mode Squad, Busta blazed through a short but maniacal set of inventive hip-hop classics. Outrageous, danceable tracks like Dangerous and Woo-Hah!! Got You All in Check drove the crowd into an excited frenzy. 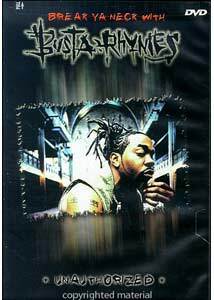 Break Ya Neck with Busta Rhymes: Unauthorized chronicles the amazing rise of Trevor Smith, known worldwide for his magnetic personality and melodic tracks. Born in Brooklyn in 1973, Busta (Smith) began his professional career in 1991 with the Leaders of the New School, a critically acclaimed hip-hop group who never really achieved popularity among the masses. His talent took center stage on A Tribe Called Quest's excellent single, Scenario from 1991's The Low End Theory album. Even more than a decade later, I still can recall seeing Busta jump from the screen and outshine Q-Tip on the often-seen video. This moment enacted the foundations for a remarkable solo career that would place Busta Rhymes among the top echelons of popular music. This documentary uses interviews with fans, journalists, and fellow rappers to explain Busta's progression. It also includes several lengthy clips from Carson Daly's late-night talk show and quotes from notable magazine interviews. For the most part, the still photos and conversations are presented in a dull fashion. Odd pauses exist between each section, and certain pictures are used repeatedly. Busta Rhymes had nothing to do with the production, and none of his music is featured. It seems nearly impossible to discuss his talents without including any songs. The obvious reasons for this missing element are a low budget and refusal by the artist to release it. Considering the absence of songs, the creators should have gone deeper and explored his background closely. Instead, they mostly provide a generic album-by-album synopsis. It does cover his burgeoning acting career, which includes Finding Forrester and Higher Learning, but never goes far enough in-depth. The albums of Busta Rhymes sport apocalyptic names like When Disaster Strikes, Anarchy, and Extinction Level Event. I never placed that much stock in these titles, but Carson Daly specifically mentions their prophetic nature in regards to September 11th. During a significant clip, the interviewer asks the artist to discuss his reasons for the destructive themes. Daly calls him a "prophet" several times and even reads the lyrics from one track to support his point. His words are slightly hokey, but it easily is the most compelling moment in the documentary. Busta remains humble and shrugs off the labels, but he does showcase an intelligent mind that wants to do more than just write the latest party tunes. Busta Rhymes utilizes an original, ragga-inspired delivery of sharp utterances and stresses of just the right syllables to generate unique music. Placed over clever beats, his style creates one of the more refreshing hip-hop sounds of the past decade. However, it is difficult to praise a documentary about his career that delves so little into any negative elements. I could forgive this problem if some live footage was included, but that side is also ignored. Having a journalist from Rap Pages magazine tell us that Busta is a great performer is not the same thing as seeing it for ourselves. Break Ya Neck with Busta Rhymes: Unauthorized is mildly interesting, but it fails to show us enough of what makes him such a remarkable presence. Image Transfer Review: This release appears in a basic 1.33:1 full-frame transfer that corresponds with my expectations for this type of documentary. The clarity level is only a slight improvement over the normal television picture, but you really don't need much more. The still photographs and short clips support the information presented and do not need to be pristine. Audio Transfer Review: A basic stereo track presents the generic background music and voice-over narration in acceptable fashion. Since this disc rarely offers any notable sounds from Busta Rhymes, a better transfer is not as essential. The narration is easily understandable, and any fuzziness that occurs during the interviews is only a minor distraction. Extras Review: Busta Rhymes really must have wanted nothing to do with this documentary. Features of this nature almost always contain some extra concert clips as a bonus to the artist's fans. No features of that kind exist here. Even the full-length interview with Carson Daly or a decent biography would have been a nice inclusion. Unfortunately, the only supplement offered is a selection between 14 chapter cues. Never one to rest on his laurels, Busta Rhymes continues to explore new avenues of music and film. Unfortunately, this documentary fails to capture the essence of his skills. We do receive plenty of information, but an inventive style is missing to present the material. I only recommend this release to diehard fans who want to own everything.